Fire hazards are a threat to employees, facilities, and the environment. Honeywell Analytics has a full range of fire and flame detectors and detection systems to fully safeguard your operation. Typical applications include oil and gas, petrochemicals, agriculture, manufacturing, water and wastewater treatment, plastics, and other specialty industrial processes. Applications of this nature require stringent fire detection, and Honeywell Analytics has solutions. 2. 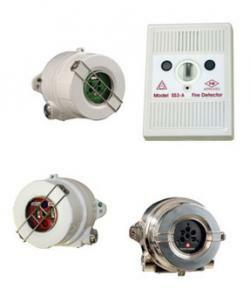 Fire Sentry FS20X, which is a Multi-Spectrum fire and flame detector that is a part of the advanced Elctro-Optical family of detection devices. 3. Fire Sentry SS3 and SS4, which are digital, Multi-Spectrum, Optical fire and flame detectors that can be fully reprogrammed. Contact AC Controls to find out if Fire Sentry products from Honeywell Analytics can help safeguard your industrial application from fire hazards.